Untitled (floor after Robert Smithson) , 2013. Propped plywood, epoxy paint, decorative flakes, and mirrors, 4 x 8 ft. x 20 in. Untitled (sRGB 1996), 2012. Archival inkjet print/chromogenic print, 40 x 50 in. each. I was first introduced to Assaf Evron by a mutual friend at an art fair in Chicago. Shortly thereafter, he and I began a series of studio visits. Our relationship has become an ideal source of material for an essay about the collaborative nature of the relationship between artist and curator, because our discussions revolve around my insistence on visual coherence—what Assaf derisively refers to as “homogeneity”—and his vociferous defense of heterogeneity as an inherent and defining feature of his practice. Over the course of a career that began in photojournalism, Assaf has worked in a variety of mediums (he defines himself as a photographer, despite my suggestion that his recent forays into the production of three-dimensional objects are indicative of a movement toward sculpture), developing a practice that is diverse, deeply intellectual, and heavily indebted to the philosophical tradition of nineteenth- and early twentieth-century German-Jewish thinkers. As an historian and a curator, I have a deep-seated (Assaf would argue pathological) need to synthesize, to locate the origins of ideas, to derive an underlying logic from seemingly disparate elements. Assaf and his work present a difficult project in this regard because over the years he has produced a broad spectrum of objects which defy my efforts to construct a cohesive, visual, artistic trajectory. Perhaps this is because his work involves a universe of ideas that range widely. His is an artistic project fueled by intellectual curiosity, which results in a constant experimentation with new forms, new materials, and new projects. I. How his work might be defined as regional? Was he, after living in Chicago for three years, a Midwestern artist? III. Whether or not his status as an immigrant lent him, and his work, a sense of anxiety; what does it mean to create art without contextual cultural references? While all of this is intellectually very productive, I inevitably leave our lengthy discussions feeling a rather pragmatic, almost palpable, desire to find a way to organize the material in front of me. How can I make a visual map of the work of Assaf Evron? Recently, while looking through images Assaf has collected, we stopped to discuss Albrecht Dürer’s 1514 engraving Melencolia I . The print, one of a trio of engraved masterworks he produced that year, depicts a winged personification of melancholy, the least desirable of the four humors identified by medieval philosophers. (Melancholy, a state caused by the buildup of black bile in the brain, was thought to be responsible for creativity as well as an inducement to insanity.) In its visual schematization of the artistic condition, Melencolia I is both a printmaking tour de force and an allegorical self-portrait of Dürer himself. 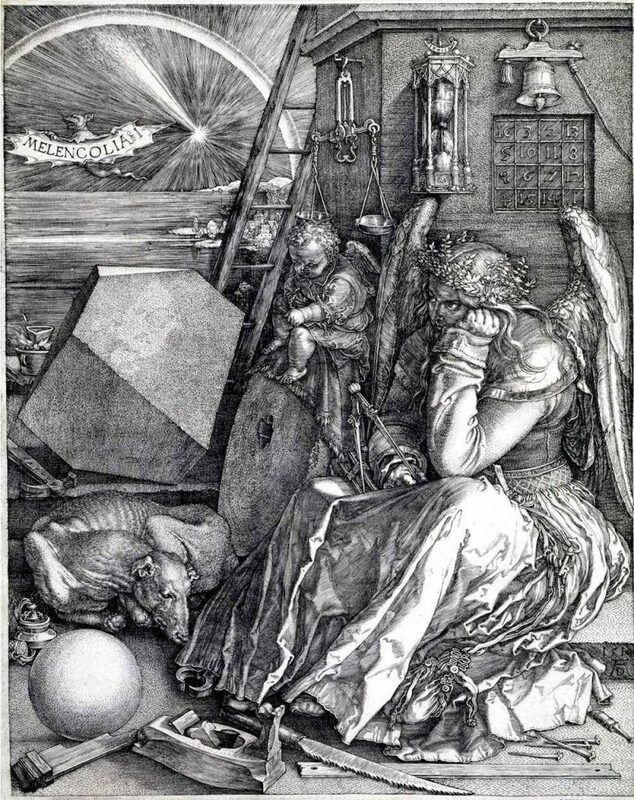 On the right, Dürer’s woebegone proxy is surrounded by the symbols of geometry, the liberal art most closely associated with artistic creation. Oddly enough, many of these items—the arc, the polygon, the sphere, the star, and the stairs—are recurring themes in Assaf’s work. Was this one of those moments of philosophical coincidence (see item VI above) or had we stumbled upon a visual map? Here Assaf and I revisit his recent production by discussing different series of works and their relationships to Dürer’s engraving. Albrecht Durer, Melancholia I , 1514. Engraving, image from Wikimedia Commons. Untitled (Richard the III, Leopoled Jessner, Emil Pirchan, 1919) , 2013. MDF, 4 x 3 x 2 ft.
Assaf and I decide to work backward and begin at the end in the hope that we would discover the answers to some of my questions. Assaf’s two current projects investigate Leopold Jessner and Aby Warburg. In execution, both Jessner’s Stairs (2013–present) and Warburg (2013–present)—as the title of the former suggests—resemble literal or figurative staircases. A ladder features prominently in Dürer’s composition. For the purposes of this discussion, it will be our staircase. In Melencolia I , the ladder is propped against the architectural structure (the exact type of structure is a matter of some debate in the existing literature on the subject) in front of which the downtrodden angel, the artist’s avatar, sits head in hand, extended beyond the limits of the image, surrounded by tools associated with carpentry. Some scholars suggest that the ladder symbolizes both the desire and inability to transcend the earthly realm, ergo the abandoned ladder represents the hope and the failure of the artistic enterprise; this painful realization casts a lugubrious pale over the assemblage. But what does the stairway mean to Assaf? What is it about this form that he finds appealing? Jessner and Warburg are spectral presences in these series, but is it the image (its formal properties) or the personas that inspire the objects themselves? 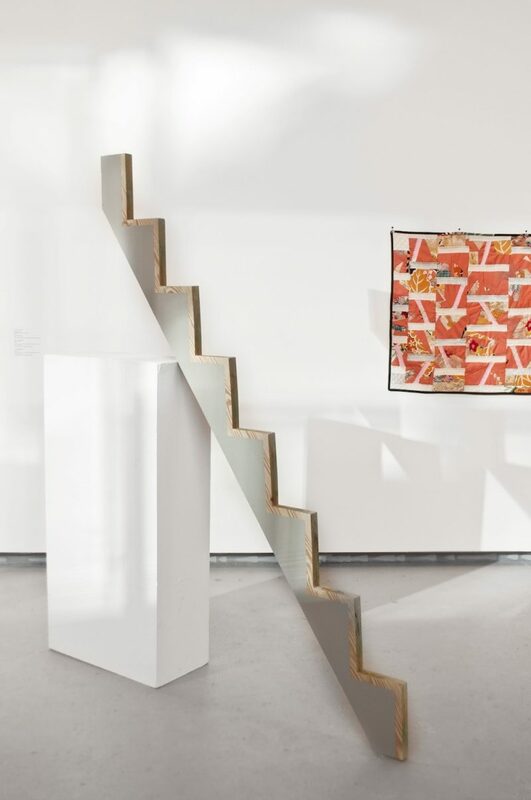 Aptly titled Jessner’s Stairs (2013), Assaf’s most recent work is a sculptural rendering of the stage set for Jessner’s 1920 production of Richard III . 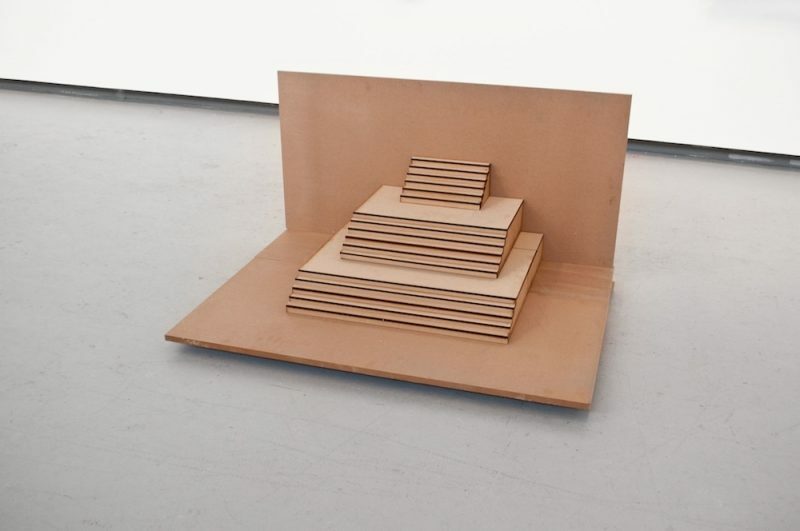 The miniature backdrop consists of a series of three sets of stairs, each one stacked upon the other and slightly smaller than the next, which in effect resembles a stepped pyramid akin to a Mesopotamian ziggurat. Assaf stumbled upon the image and the obscure figure of Jessner by happenstance in a book about Bertolt Brecht’s Berlin fished out of the garbage at the School of the Art Institute of Chicago, where he was an MFA student. 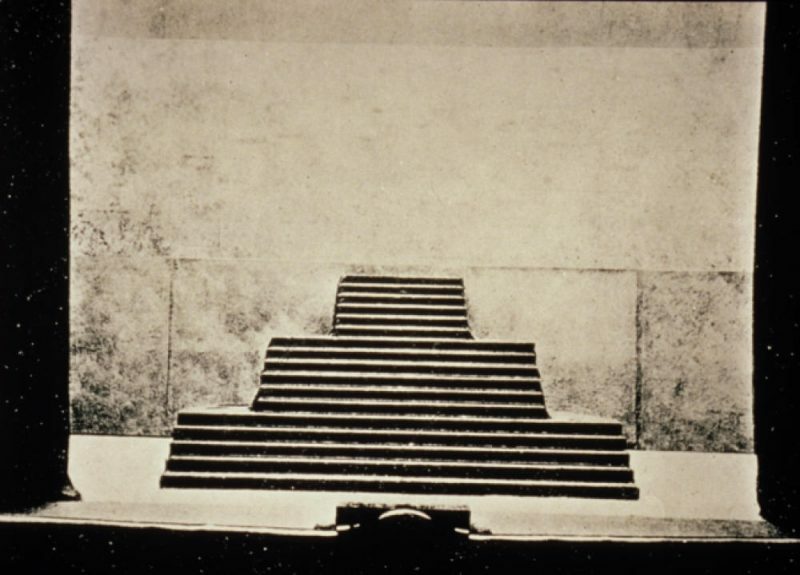 Source image: Jessner’s stage in Berlin, 1920. Jessner’s set has no walls, leaving the stage exposed, open like a blank canvas to the interplay of actors, objects, light, and surfaces. These are all properties of photography, a medium Assaf knows well and which he exploits as elements within his sculptural rendition of Jessner’s stage. The set is an interesting proposition, as its starkness seems to preclude the production of illusions—there is no place to hide—despite the fact that the successful theatrical enterprise relies on illusions and the suspension of disbelief in order to be credible and engaging. Perhaps, I suggest to Assaf, the attraction to Jessner is the link between his vision of theater and Assaf’s training in photography. Specifically, I suggest that, in a sense, photography has the same power as theater, namely the ability to create the suggestion of a narrative where one does not exist. 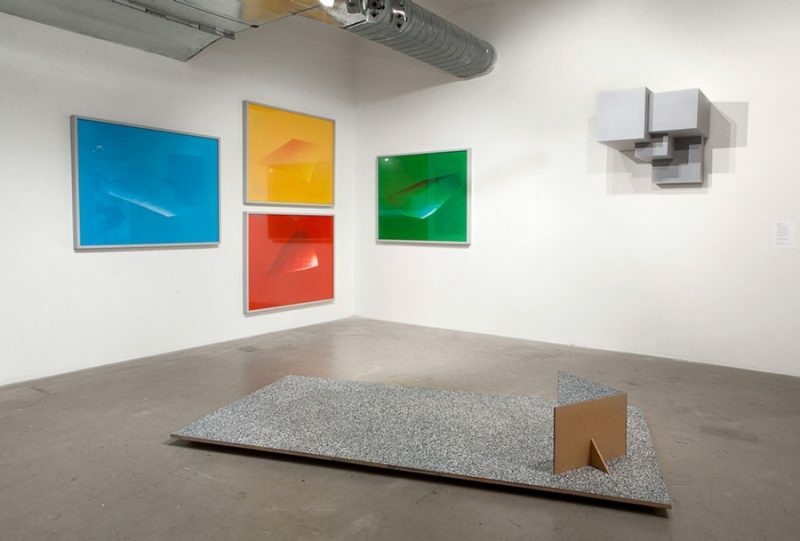 Assaf responds by saying that he was drawn to the way the image combined “monumentality, abstraction, and perspective.” Investigating its source led him to Jessner. This answer solved one of my questions about Assaf’s work: it is the image rather than the persona which drives the creation of objects—at least in this case. Abigail Winograd Is it a coincidence that both Warburg and Jessner were prominent figures in the artistic and cultural milieu of Weimar Germany? Assaf Evron The persona is an entry point. There is always a relationship between the visual and the persona. I want to know what they were trying to articulate. It is like the way Walter Benjamin articulated his vision of modernity through other individuals. 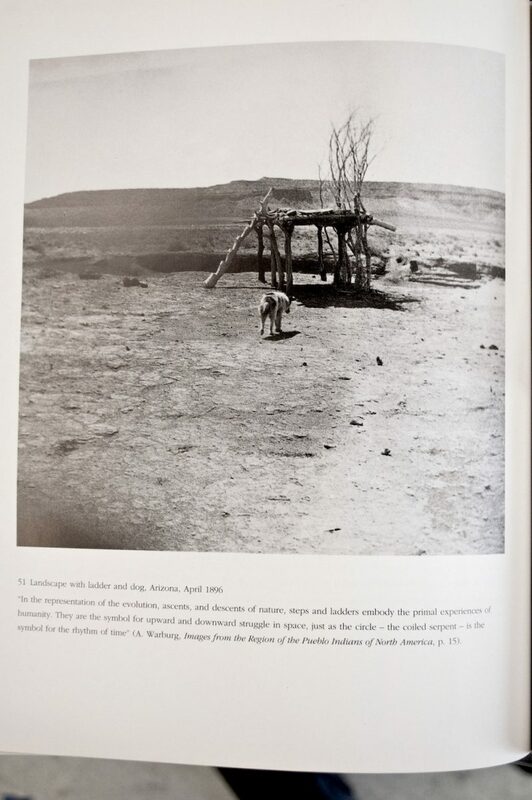 Untitled (Landscape with Ladder and Dog, Arizona, April 1896) , 2014. Wood stair stringer/paint, dimensions variable. The second series we discuss shares a title with the photograph that inspired it. Like Jessner’s Stairs , Landscape with Ladder and Dog, Arizona, April, 1896 (2014) is executed in three-dimensions and relates to the work of another now deceased German-Jewish thinker. Again, I ask if there is a deliberate connection between the work and the prewar German intelligentsia. Assaf cautions me not to create direct parallels, since Warburg is only present in the work as a spiritual manifestation. Assaf has had a longstanding academic interest in Warburg and his intellectual comrades, including Erwin Panofsky. (It is interesting to note that Panofsky wrote, with Fritz Saxl, one of the most influential examinations of Melencolia I , published in 1923. His assessment of the work as a “spiritual self-portrait” remains the dominant explanation of the image, as well as the inspiration for this series of discussions.) Specifically, he often reflects on Warburg’s understanding of how images operate, that is, the image’s ability to activate other images and thereby create a web-like relationship among them. Source image: Aby Warburg, Landscape with Ladder and Dog, Arizona, April 1896. This series began after Assaf found himself living in the United States and decided to revisit the famous lecture on the Pueblo Indians of the American Southwest, based on Warburg’s fieldwork in America, delivered at the Kreuzlingen Asylum, a psychiatric clinic. The talk was to serve as proof of Warburg’s reestablished sanity and therefore the basis for his release from said facility. In rereading the lecture, Assaf found himself drawn to the photographs accompanying the talk that Warburg took during the days spent doing research. These images of pots reminded Assaf of a set of stair stringers he came across years before at a Home Depot. Warburg was interested in the ways in which Italian Renaissance artists translated visual motifs from pagan cultures into their work. Assaf saw the same motif echoed in the stair stringers and was interested in how it had been transmitted to present-day Chicago. For the Pueblos, these were sacred images and objects. In Chicago, they become mass-produced home improvement tools. If it was the found image that inspired Jessner’s Stairs , the formal qualities of the stair stringer, an object to which Assaf felt a strange affinity years before, were activated by revisiting Warburg’s lecture and its accompanying photographs. In this instance, the visual form came first and was animated by the persona but in both series a photographic image has been translated into three-dimensional form. What have we learned today? Assaf often refers to his process as generative. It occurred to me that this layering of meaning produced by the image, the research, and the persona is the generative process Assaf describes. 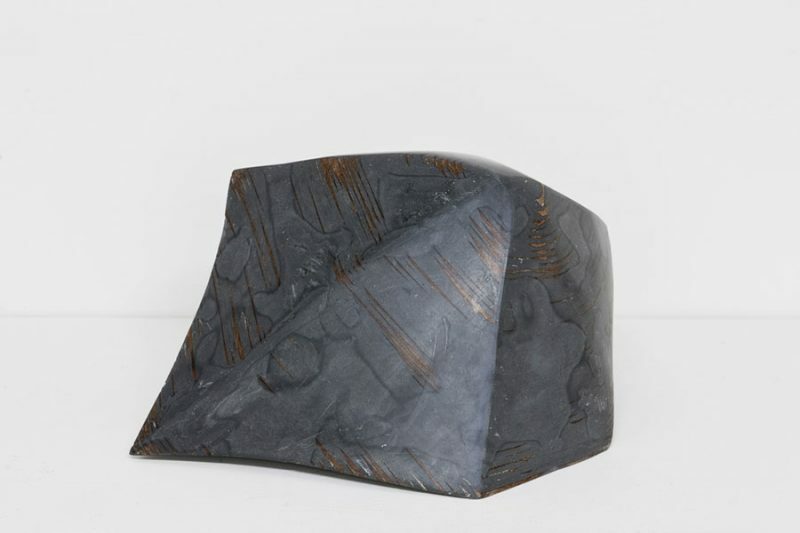 However, the act of translation from structure (object) to photograph (of object) to sculpture (Assaf’s object) seems to be just as important as the relationship between photography, architecture, and sculpture. If Dürer’s ladder symbolizes the hope and failure of the artistic endeavor, Assaf’s ladder (the stairs) implies a kind of hypothetical architecture—imagined, malleable spaces which combine the illusory nature of the photograph, the physicality of sculpture, and the monumentality of architecture.